This item was updated on afternoon of Thursday 19th October, where changes have been made to previous text it is in bold. Cutting through the rhetoric and PR is never easy but sometimes statements are made where you feel you need to stand up and say it does not make sense and one comment from the Economic Development Officer in Mid Devon District Council about the performance of VDSL2 is one of those. You tend to find you get the M5 corridor or major population hubs such as Crediton which are reasonably well serviced. That’s not to say they’re able to achieve high speeds as a result of that; it just means there’s fibre to the cabinets within those areas. But many of those are heavily loaded with customers so whereas you could be getting several hundred megabits because there are so many people trying to use a single cabinet, they’re each achieving a couple of megabits per second for example, so you don’t get the wider benefit of that. The service would be provided by linking the villages between the Link Road and the A377 as well as the Link Road between Crediton and Tiverton along the A3072m creating a ring to enable wider coverage. Economic Development Officer at Mid Devon District Council, Chris Shears who has not spoken to Devon Live but we believe their item is based on the audio file/transcripts. A full audio recording of the council meeting of 7th September is available on SoundCloud with the broadband session starting at 48:21 and carrying on until ~1:21:00. The statement is confusing because FTTC (Fibre to the cabinet - VDSL2) has a maximum retail speed of 76 Mbps with the physics of attenuation in copper being the largest factor in the speed people get, at a guess the 'several hundred megabits' part is referring to the Gigabit fibre backhaul from the cabinet but the 'couple of a megabits per second' is not something that we recognise as being normal for FTTC, assuming the comment is about congestion slowing down users at peak time. This is not to say that there might not be one cabinet somewhere in the UK where people are seeing a lot more than the usual 5 to 10% drop in peak time speeds but we do not know of a cabinet where speeds have dropped from maximum speeds to just a couple of meg and this applies to both commercial and BDUK cabinets anywhere in the United Kingdom. The reality of contention is that it is much more common in the backhaul arrangements from the handover exchanges that individual operators have control over and this is actually an all fibre part of the network and nothing to do with VDSL2. ADSL services are still more popular since upgrades are not automatic and ADSL was seen to record a median download speed of 5.5 Mbps in Q3 with the slowest 20% of results being under 1.7 Mbps. 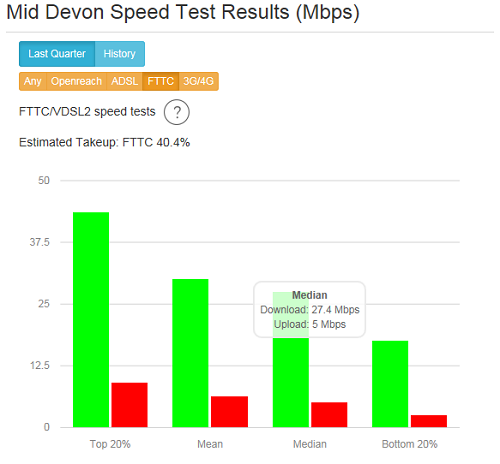 The areas between Tiverton, Crediton and Chumleigh are largely a part of Mid Devon where the phase one BT contract has not delivered masses of new connectivity, but to start a Mid Devon funded Local Full Fibre Network Programme appears to be saying that they are not expecting to see Gigaclear or gain share from the original BT contract coming to the area. Then again knowing the way councillors across the UK have referred to broadband technology in the past our money is on this 'ring' actually referring to a rural based metro fibre network, rather than a systematic roll-out of Fibre to the Premises. Pennymoor actually has native Openreach GEA-FTTP live in the village with up to 38 Mbps through to 330 Mbps options, and Gigabit once retailers start selling it. There are some outlying premises that don't have access. This picture of the larger population areas being served and the dispersed rural areas missing out was a common feature for the phase one projects, and was driven by several factors, contract deadlines to cover x,000 by a certain date, cost overruns to be bourn by the commercial partner, value for money tests. The later phase two projects have generally reached deeper into the rural areas and in Devon a feature of 2017 has been Openreach delivering FTTP in the closing phases of the phase one project. In four years Mid Devon has gone from 12% of premises with access to superfast broadband to 74.9% and there are an additional 14.3% with VDSL2 delivering 23.9 Mbps down to no benefit. Individual councils of course need to fight the corner for their residents and businesses, but the unfortunate reality is that until 100% coverage at speeds that make people happy is reached we will have on-going issues and those missing out are becoming increasingly vocal. How local and national government manage this is probably the most important part of the next few years with regards to broadband as no-one will want to be in the final 2% that are abandoned to the Universal Service Obligation provisions. The following paragraphs and maps were added on 19th October. Listening to the full audio the scope of the project is clearer, but the news a district council has expressed an interest in the Governments full fibre fund would not be enough to warrant a news item given how busy things are behind the scenes currently, the aspect that we wanted to talk about was the 100's of megabits and speeds on cabinets dropping massively and while the wording was slightly different in the actual audio compared to the Devon Live transcript the meaning is no different. If a district council gets a full fibre project approved then that is newsworthy. The full audio makes it clearer that the full fibre roll-out does appear to be about creating a ring in the area mentioned with diverse routing and a major focus is on the path it takes following the various geographic peaks so that transmission towers can be deployed to deliver service and that the area involved is not part of the phase II CDS project. It was not said in these exact words but in normal broadband parlance this appears to be a project to provide fixed wireless access with masts fed by fibre optic network. It is not clear from the audio whether the full fibre aspect will include a roll-out of FTTP to premises in villages the fibre passes through and we would hazard a guess that this is what the Governments full fibre fund is actually meant to deliver i.e. not just building fibre rings but extending those rings that final 100m to 200m into each property they pass. Things are in the very early stages, so at this time it looks likely that the idea if the fibre ring would be council owned and commercial partners may or may not be sought to deliver the fixed wireless the fibre ring will support. Mr Chris Shears expressed frustration at difficulties getting a map of where Openreach infrastructure is and thus we need to highlight our mapping (the link has VDSL2 and FTTP layers turned on and is centred in the area of discussion), the VDSL2/FTTP layer does not cover all postcodes to get an idea of the ones that are totally missed out form the phase I roll-out you should look at the ADSL speed layer. Click image for larger version showing speed estimates for VDSL2 where live and the black dots representing postcodes with access to Openreach GEA-FTTP. The scale of the problems in Mid Devon District Council area are such that if you accept a minimum of 10 Mbps download speed and upload speeds over 1 Mbps as being at least a decent safety net then some 17.9% of premises do not meet that target currently representing some 6,500 premises. The spokesman wasn't expecting you to be listening, so thought his pet scheme would sound better if he exaggerated both the possible (Hundreds of) and the actual ( a couple). This seems to be more common among political entities since Trump used/uses it so successfully. Nice to know you have called this one out! As someonewho lives in Mid Devon it is certainly the fact that many deployments from the Phase 1 program were putting in a new FTTC cabinet right outside the exchange and moving exchange lines over to it. However in Mid Devon in particular a lot of properties are located over 2km from the exchange and also exchanges are not always in village centres. Villages and hamlets also tend not to clustered around a central point either but strung out giving huge variations in attainable speeds. Phase 2 is mainly along the M5 for Gigaclear (makes sense) but north & west of Tiverton have missed out. What a confusing statement. As far as cabinets being overloaded, then is that actually possible/likely? There must be thousands of heavily loaded FTTC cabinets in the UK, and why would the CDS ones be especially affected? I assume OR has standard configs for cabinet fibre backhaul. A more likely scenario is than overloaded cabinets would be congestion in back-haul after the hand-over point, at least with some ISPs, if it's an expensive to connect location. If the representative from CDS could give some example postcodes where this is happening then TBB might have some stats. CDS is like most other BDUK projects - the phase 1 work tended to do standard cabs and EO lines outside the exchange. It is only in later phases that BT have started to add extra infill capability in other projects, to cope with the longer lines, but CDS obviously chose not to go with BT before that work was needed. SIN 498 mentions that Openreach has a downstream prioritisation rate of either 30Mbps or 15Mbps (depending on product), or the actual line rate if lower. And that fairness comes into any discard decisions when congested. The DSLAM comes with a single gigabit backhaul fibre activated, but more can be plugged in if necessary. I'd imagine that Openreach would have to endeavour to meet the aggregate prioritisation rates as a minimum, allocating additional backhaul fibres as necessary. Usual posts from the usual apologists. But when are we going to get some real journalism? TBB got their info from another news source Devon Live whose journalists' jobs are now retained by the number of online hits they can generate! So, instead of an actual interview with a real council official taking place all they now do is trawl the minutes and transcripts of council meetings in order to find some headline grabbing comment, then take it out of context and then publish it. Please read the transcript itself (meeting was on 7th Sept) before jumping to the usual inane conclusions! V.Sad! As the officer in question, I can state that no conversation ever took place between Devon Live and myself relating to this project. They (Devon Live) have taken the transcript from a Council meeting that took place on the 7th of September, and have pasted sections of the discussion (at which they weren't present) to make a story published over a month later. I was not referring to cabinets in areas with very few households having capacity issues. I'm happy to enter discussion with anyone, but on a facts basis and with first hand, not third hand information. Happy to change the quote to say it was in respect to a meeting on 7th September. Also listening to audio to confirm whether the words we used were spoken, this may take some time as the audio is 1hr 38 minutes long. The draft minutes do not seem to include the comments. The draft minutes appear to suggest the idea is not a full fibre roll-out, but a fibre ring to help service wireless masts. Have now made it to the part of the audio and Mr Shears does say a good approximation of the words Devon Live used, there is a few changes I will make and this will bounce article to top of the stack to highlight that changes have been made. I was referring to the capacity of cabinets in areas with high demand, not to the more rural villages in the rest of the article. Where a cabinet has reached its maximum number of connections, new customers either have to wait for an upgrade to the cabinet, or to use a slower service. I accept that it was a poor choice of words, and that I should have talked about connections rather than capacity, but given that I was delivering a presentation to councilors and senior staff, I was a little nervous, and it seems slightly unfair to make me out to be a technical incompetent as a result. If you want a right of reply you need to email the team from your council email account so that we have a copy of the wording you want added. Comments in news can be anyone. For info: the project would be about delivering FTTP in the covered villages. My name is Chris Shears, not Mears. I am grateful for the link to the map you have provided. It is much more than I have received from "official" sources. I still think the title of the article is unfair, given the rest of the story, but much happier to accept the body of it now (though I have never spoken to Devon Live on this topic, so that is factually incorrect). Many thanks for updating it. If the project is about Fibre to the Premises then I do not think you made that clear to the councillors at all, the focus was on 'transmission towers' and 'high speed signals to surrounding villages'. Adding that premises within X metres of the route would get access to full fibre broadband was the missing statement. If that is actually a key point, then happy to take a map of your proposed route and add it so people can see which villages potentially would get access to FTTP and the additional benefit of fixed wireless for those '12km away' - 12 km a figure mentioned in the audio. CShears appears to be repeating his claim that overloaded cabinets are giving only a few megabits per second. If this is so, then I'd expect some evidence of this as, across the country, there must be thousands of cabinets with high takeup rates. The issue of speed drop over distance is a different issue of course. Back-haul capacity after the handover point another one, but neither are issues to do with overloaded cabinets. I haven't listened, and am only going on @Chris' clarification 6 posts up. With the clarification, it now looks like the issue is to do with the number of ports available, rather than the bandwidth. The reference to slow speeds may then be what a user will be consigned to (with ADSL) if the cabinet is full. Of course, the primary issue then is to get BT to add capacity to the cabinet (either by adding the higher-density linecards, so creating more ports), or by adding a second cabinet. Such actions such be under BT's normal activities, and not be part of the BDUK project. If someone has the location for a cabinet where capacity has never been added am all ears, since while it can be months sometimes to add capacity we've not found a location where it has not happened. One thing people should check if in situation of no capacity is whether an upgrade from IPStream ADSL to WBC ADSL2+ is available (or an LLU ADSL2+ provider) as the backhaul and IP Profile system on the WBC system is much better. Did I miss an announcement from CDS about Gigaclear's coverage plans for their lots? Can someone kindly confirm the process for getting BT to increase port capacity? Surely the real issue is huge swathes of Mid Devon are not receiving a reasonable service after the the spending of considerable amount of public funds. Been to several meetings in the area and can confirm the pent up demand is huge! While the economics of reaching isolated communities are well understood, it is galling to recall a BT regional executive publicly confirming a couple of years ago that "we do not string fibre from poles", to find at the end of the phase 1 program that this is exactly what they do! The process is just before capacity runs out, then Openreach add the cabinet to the others that are waiting on the teams that add the extra hardware needed. Council and public have to do nothing. If the list of cabinets affected by capacity issues is too large to post in a comment, then email [email protected] and we can chase Openreach for estimated resolution dates. Remind us what the target for coverage that CDS gave BT in the contract was in the Mid Devon District? @WWWombat - promise of "detailed rollout plans by the end of July" was quietly dropped, to be replaced by that announcement early last month of this tiny inital rollout. The worrying bit is this - "The first communities chosen to be connected have been selected based on their location near to existing connections to main broadband cables." These communities are little more than 5Km from the edge of urban Plymouth - what hope for us, 18Km from the edge of Exeter ? Also raises questions about completion by end 2019, given these few won't be live til February 2018. Allegedly. It is inevitable that the communities closer to existing fibre infrastructure get done first if there is a target to reach a particular number of premises by certain target dates and within a cost envelope. The logical way to extend a network is from the inside out using the fibre to each community as a stepping stone to others further out. It also means revenue starts flowing quicker, which is not unimportant. The more remote the community, the more planning there will be, more wayleaves to negotiate and more obstacles to overcome.
" Surely the real issue is huge swathes of Mid Devon are not receiving a reasonable service after the the spending of considerable amount of public funds." @TheEulerID - yes, obviously, but the worry is if it's taken this long to get started on one small group of villages close to existing fibre, 8 months after contract award, what are the chances of completing everything in another 27 months ? Wasn't Gigaclear chosen because BT couldn't committ to dates? "Surely the real issue is huge swathes of Mid Devon are not receiving a reasonable service"
It depends on the reason for not getting a service. If the issue is a lack of coverage, then you're learning that a 90% target leaves 10% out. And learning that Gigaclear has no magic wand, and still leaves 5% out. If the issue is a lack of port capacity, then it is a matter of getting an upgrade added. The cause could be just a new card, new tie cables, or a whole new cabinet. Each take some time to both plan and act on, but should be triggered as the previous linecard reaches 80%. That's more in line with what I thought I'd seen over the last few months. I thought BT were rejected because at the time, CDS wanted an outside-in approach for this 5%, and BT couldn't meet either the coverage target or dates. We (public) don't know if BT were trying to offer coverage in the desired way, or were following their regular "inside-out" approach but still couldn't hit the targets. The tender won by Gigaclear was more woolly on demands for outside-in, but was emphatic about wanting a lot of coverage ASAP. The project is about FTTP??? If us lot don't understand this what hope is there for a here today gone tomorrow councillor? It wasn't that BT wouldn't commit to dates, but that the dates/timescale they would commit to was not acceptable to CDS. Listening to more I can't see the council running a network, which might be a length of fibre, is a good idea. Why are they not talking to Gigaclear and TrueSpeed etc.? Andrew is absolutely correct about the advantages of getting moved from 20CN ADSL to 21CN ADSL2+ or ADSL2, if you are lucky enough to have the option. You might have to ask you ISP to move you over. I paid a very small fee (~£10) and my ISP aa.net.uk moved me early. There are many reasons why 21CN and ADSL2/2+ give speed improvements. I saw a big increase in downstream sync speeds. Tip: Extremely long line? Try forcing ADSL2 only rather than "auto", disallowing ADSL2+, in modem settings and compare. Anyway, ask. If your ISP doesn't understand the question, then change to a competent ISP.